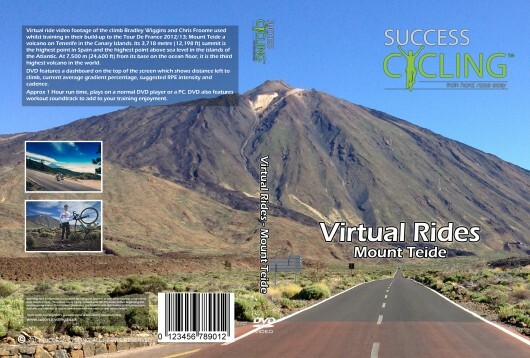 Virtual ride video footage of the climb Bradley Wiggins and Chris Froome used whilst training in their build-up to their Tour De France victories in 2012 and 2013 (Mount Teide in Tenerife). Virtual ride video footage of the climb Bradley Wiggins and Chris Froome used whilst training in their build-up to their Tour De France victories in 2012 and 2013 (Mount Teide in Tenerife). Mount Teide is a volcano on Tenerife in the Canary Islands, its 3,718 metre (12,198ft) summit is the highest point in Spain and the highest point above sea level in the islands of the Atlantic. At 7,500 metre (24,600ft) from its base on the ocean floor, it is the 3rd highest volcano in the world. DVD features a dashboard on the top of the screen which shows distance left to climb, current average gradient percentage, suggested RPE intensity and cadence. Dashboard at the bottom shows speed, altitude and current gradient percentage. Approx 1 hour run time, plays on a normal DVD player or PC. DVD also features workout music to add to your training enjoyment.